It would seem there are some real inconsistencies with the 2015 Property Assessments. This article will focus on Waterfront properties. Your 2015 BC Assessment notice is based on what they determine the value was as of July 2014. I ran sales numbers for the year before that from Aug 2013 to July 2014. This gave me 23 Oceanfront sales. Looking at those sales I decided to run the new assessed price on each one of those properties that sold. How much closer can you be to knowing current value than when a property actually sells, right? 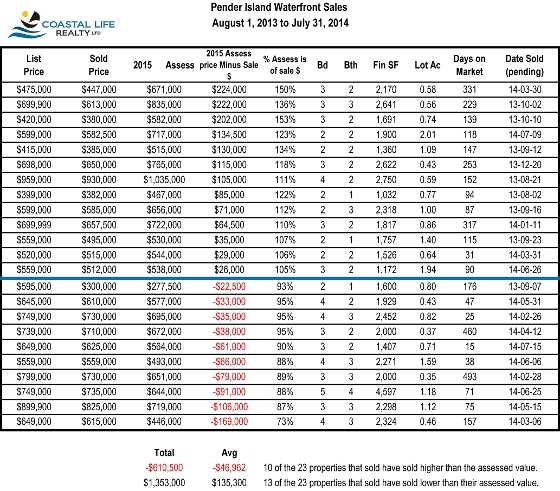 What I found was only 10/23 sold above the assessed value (what most people expect), the other 13 sold below the 2015 assessed value. The most extreme property sold for $224,000.00 less than the 2015 assessed value. The 13 properties that sold for less than the assessed value range from a difference of $26,000 to $224,000 and come to an average of selling for $111,000.00 below their assessed value. On the opposite side the most extreme property sold $169,000.00 above the 2015 Assessed value. The 10 properties that sold for more than the assessed value range had a difference of $22,500 to $169,000 and come to an average of selling for $70,050.00 more than their 2015 assessed value. One could conclude that out of the 23 properties sold only 4 of them would qualify for what people expect to see in their Assessments. That is a 17% accuracy rate. Failing grade.